No weirdness today, folks, just a little about a local museum that would love your help with some funding needs. I’ve written some about Wilson North Carolina here before, when I discussed the Whirligigs. It’s a pretty small town, with about 50,000 residents, and honestly, there’s not much to do there. Thankfully, they have the Imagination Station. Here’s their website. Right now it’s a hands-on science museum focused mostly towards kids elementary through middle school aged students. They offer programs in the old courtroom on the second floor (the building was once a post office and a federal court house) and the rest of the museum is exhibits. Third floor is dedicated to Coastal Plains history. Lots of schools come through this museum during the school year, and families traveling I-95 during the summers often make a point to stop in the museum on their way north or south. It’s a fun, busy, bustling museum that would very much love to grow into something even better with the help of a permanent exhibit that they want to install. They want to offer area schools even better programs, and they want to provide something amazing to the people of Wilson. Enter Science on a Sphere. (http://sos.noaa.gov/What_is_SOS/index.html) It’s a really really great kind of exhibit that can afford all kinds of neat opportunities to museums and organizations that have it. 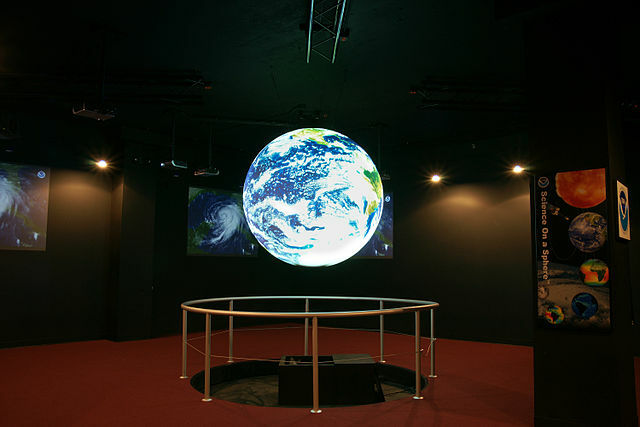 In short, it’s a 68 inch diameter globe, four projectors, Ubuntu, iOS, and dozens of free-for-use programs about everything from space to geology to weather. Here’s a pic, courtesy NOAA. In many ways, Science on a Sphere is a reverse planetarium, and the Imagination Station would love to install one. The only problem is that Science on a Sphere is expensive. Imagination Station needs to raise $100,000 to match a grant in the same amount. Are you local, or from the area originally? Maybe you want to make sure kids have a great science education. Maybe you’d like to help inspire the first man or woman who stands on Mars. Maybe you just want to give back to your community, and help small towns grow. The Imagination Station is a great museum, and what they’re trying to do is really awesome. I’ve posted a link to their information page regarding the Science Rediscovered Campaign. Eventually, they’d like to make the entire museum really fantastic, so take a look at the PDf of their plans. I’ve also put a link to their contributions page on Rally.org. Please consider giving to this museum. If everyone gives $5, think what could happen.